Newton, NJ – September 28, 2012. Thorlabs, a leading worldwide manufacturer of photonics tools, has designed and released a new Liquid Crystal Noise Eater to enrich its rapidly growing liquid crystal product line. A precision instrument for stabilizing and attenuating laser beam power, the noise eater design does not incorporate any moving parts. 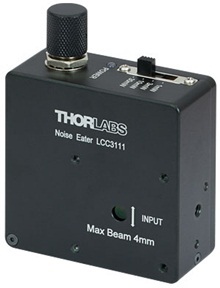 Thorlabs’ Liquid Crystal Noise Eater is designed for use with light in the 425 - 650 nm wavelength range and reduces laser noises in the range of DC to 2.5 kHz. With excellent long-term stability, this instrument can stabilize the output power to within ±0.05% of the selected output power during any 8 hour period. Development is already under way to add models for use in the 650 - 950 nm or 950 - 1650 nm spectral range. This Liquid Crystal Noise Eater consists of a variable attenuator (liquid crystal wave plate and polarizer), a calibrated beamsplitter, and a servo controller to control the modulator. Linearly polarized light is input into the liquid crystal retarder, which, together with the output polarizer, acts as a variable retarder. A beamsplitter directs a small portion of the beam to a feedback loop consisting of a photodiode and control servo. The servo compares the optical signal to a preset signal level and applies the appropriate adjustment voltage so that the optical signal reaches the desired level. For laser systems with strict power stability requirements, such as those used for optical trapping, laser linewidth control, spectroscopy, optical pumps, seeding, and precision interferometry, Thorlabs’ Liquid Crystal Noise Eater provides an integrated solution. The Noise Eater made its debut at Photonics West 2012 in San Francisco and was also featured at CIOE in Shenzhen, China earlier this year. For more information, please see the complete product presentation by visiting http://www.thorlabs.com/NoiseEater.